Rogue looking a bit worried before the operation. 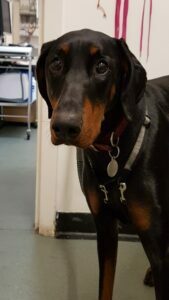 Rogue is a two year old Doberman. She came to us recently because her owner had noticed that she had a fractured tooth. This tooth is the main chewing tooth at the back of the mouth, there is one in the upper jaw and one in the lower jaw and they are known as carnassials and are particularly useful for chewing meat. 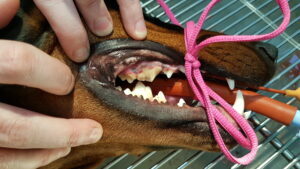 Dogs don’t look after their teeth like we do so tooth fractures are not uncommon if they chew stones and sticks etc. If the root cavity of the tooth isn’t damaged then we can often leave the tooth in place, it will always be more prone to future decay as the enamel has been damaged but as long as we keep an eye on it to spot early signs of progressing disease it can stay where it is. In Rogue’s case she had opened the root cavity so we have to remove the tooth. 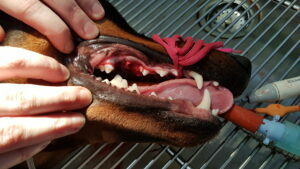 It was probably painful but cats dogs and cats are remarkably good at disguising this sort of pain and keeping eating. If left the decay would have got into the gums and bone and caused more pain. Rogue duly came in and the tooth was removed under general anaesthesia. The carnassial tooth is particularly well attached as it needs to be for it’s use, it has three roots, two at the front and one at the back. 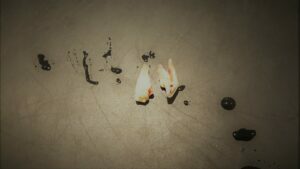 Taking out a three rooted tooth is extremely difficult and the chance of doing excessive damage to the surrounding bone, or worse of fracturing the root and leaving a bit behind is high. To get round this problem we cut the tooth on half with an air pressure driven burr and then take the tooth out as two teeth, one with one root and one with two roots. Before, the offending tooth is the large one on the upper jaw. It can still be difficult to remove but we have a very powerful air-driven dental machine that helps enormously. After we had removed the tooth we scale and polish the rest. 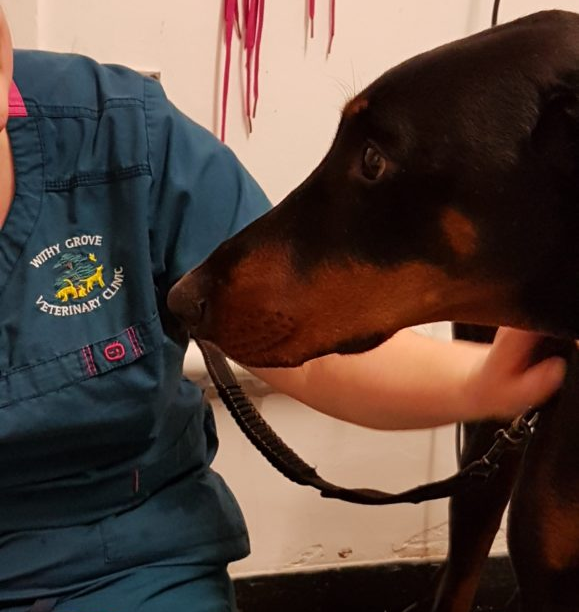 We always do this after any dental procedure to keep the teeth and gums as healthy as possible, this is particularly important as we have to anaesthetise animals to perform a scale and polish (as they won’t sit still with their mouth open!). Anyway, Rogue made a full recovery assisted by some pain relief and is now ready to resume her superhero duties. The offending tooth, cut in two to remove. The front portion on the right has two roots and the back portion, one.